John A Macbeath died at Mid Clyth 17th February 1949 aged 67. Wife Isabella Gordon died 6th November 1938 aged 64. Father Robert Gordon died 4th July 1927 aged 93. 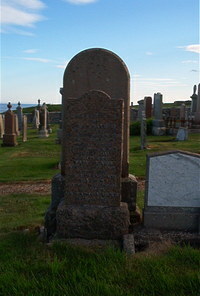 Mother Mary Bain died 15th January 1924 aged 81. Also their family Danny, Alex, Edith and Dinah.